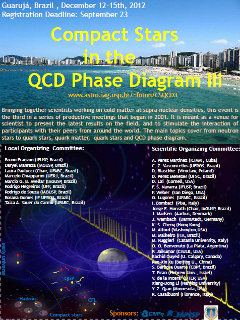 The third Compact Stars in the QCD Phase Diagram will be held in the city of Guarujá, Brazil, from December 12-15, 2012. We would also like to call your attention to the 26th Texas Symposium on Relativistic Astrophysicso to be held in the city of São Paulo from December 15 - 20, 2012 . Last update: December 06, 2012.